Idaho Falls-based Bank of Idaho was recently awarded the Idaho’s Brightest Star Award at a ceremony Jan. 21 at the Owyhee in Boise. The purpose of the Brightest Star Awards program is to recognize and encourage volunteerism by citizens of all ages throughout the state. Bank of Idaho was the winner in the Corporation and Small Business category, based on the efforts put forth by its employees. The award came in recognition of an internal initiative in which employees committed to “A Year of Service” — 8,760 employee hours (literally, one year’s worth of hours). At the end of 2015 the final tally stood at 9,011 hours of donated time. Idaho Gov. Dirk Kempthorne and the Governor’s Coordinating Council for Families and Children established the Governor’s Brightest Star Awards in 2001 in partnership with the Association of Idaho Cities. 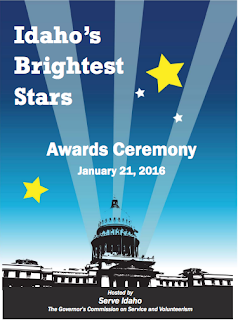 Since its inception, more than 500 individuals and groups have been recognized as Brightest Stars.